NetFlow Analyzer is a total traffic analytics tool from software developer ManageEngine whose primary function is to give administrators a real time view of network bandwidth performance. It is essentially a bandwidth monitoring solution that provides visibility into network traffic patterns and bandwidth to optimize networks. The system captures, analyzes and reports bandwidth usage. Aside from these, NetFlow Analyzer is able to carry out network forensics and traffic analysis. Network bandwidth and traffic patterns are monitored by the system at an interface-specific level, while traffic patterns and device performance can be uncovered by drilling down into interface level. It generates one-minute granularity reports to provide real time insights into network bandwidths. The software is capable of detecting threats, both internal and external as it makes use of Continuous Stream Mining Engine technology and if ever any threat manages to get past a firewall, these anomalies can still be tracked. NetFlow Analyzer solves IT challenges and problems faced by many of the world’s leading enterprises and companies. With the solution, monitoring bandwidth usage patterns and analyzing traffic trends is made easy. The tool enables users to determine the applications that are consuming the most bandwidth, the top talkers in their network, and the volume of traffic at a particular time. It generates reports so users can understand and analyze how bandwidth is being used and who is using it. The network monitoring software also offers capacity planning capabilities by allowing companies to access reports about their bandwidth growth and come up with informed decisions so they can address their bandwidth needs and implement changes. NetFlow Analyzer has a rich set of network bandwidth and traffic monitoring features that help users understand and address network slowness and bandwidth delays. To clearly visualize how bandwidth is being used on their network, the software classifies traffic based on applications, interfaces, protocols, and hosts. Thus, users will be able to determine which of their applications are consuming the most bandwidth and who are the ones using the most bandwidth. The software is also built with a customizable dashboard that shows statistics on bandwidth usage. Because of this, users can identify the top talkers or those hosts, applications, and conversations across a specific interface that are using the most bandwidth. NetFlow Analyzer can present how bandwidth is being used at different time intervals. Thus, it allows users to view bandwidth usage on a daily, weekly, monthly, or yearly basis. This way, they will be able to track bandwidth usage patterns and traffic trends, and see how traffic grow over a period of time. NetFlow Analyzer ensures that the root causes of network issues and spikes in network traffic are immediately identified. Thus, the software helps users detect spikes in network traffic that affect the performance of applications and result in network outage, and at the same time, enables them to pinpoint what exactly generated such spikes. Through the aid of its advanced forensic reports, users will be able to access specific historical data and drill down into specific parameters so they can troubleshoot network spikes faster and more effectively. The network monitoring software delivers a threshold based alerting capability. This means it sends alerts and notifications when the bandwidth and traffic utilization goes beyond the threshold settings defined by users. Bandwidth usage limits can be set per groups of IPs or devices. As users set bandwidth usage limits, they can also specify the time periods when those limits will be applied. In addition, they can set how often bandwidth and traffic utilization is allowed to exceed the threshold before the software sends an alert. NetFlow Analyzer offers capacity planning capabilities which assist users in measuring their bandwidth growth and create plans so they can adapt to their evolving IT environment and prepare for their future needs. The software permits them to pinpoint bottlenecks in bandwidth usage as well as wasted bandwidth. NetFlow Analyzer has a mobile app for iPhone which enables users to monitor LAN and WAN traffic from any location and at anytime. Through this app, they can access interface traffic information, traffic trends based on application, user, and conversation, color-coded alarms, and more. Network efficiency is critical to productivity, which can be directly impacted by the number of apps and services across a network. NetFlow Analyzer’s Network Manager can investigate problems with app performance using QoS-related reports. Issues, when identified can be corrected by configuring the appropriate service class for a particular app. The tool makes sure that appropriate levels of service are available for critical applications. To ensure that key applications are prioritized on your network, the software monitors these tools via application mapping and grouping. Administrators are likewise provided with a clear view of what apps are running over the network and the bandwidth that they are consuming. Application prioritization is ensured as the system easily views protocol distribution. Network Analyzer can provide a richer user experience through a tool called Cisco Medianet, which is a network designed for media traffic. What it does is optimize network performance even if it is littered with rich media traffic, which are known to consume a lot of bandwidth. The tool likewise simplifies problems with media rich traffic transmissions while speeding up content delivery. To wrap it up, the platform’s OpManager Plus network management suite can manage different aspects of a network, which include network performance, bandwidth traffic analysis, network configuration, IP address and switch port and firewall log analysis. It also provides a clear view of a network from a single console. What Problems Will NetFlow Analyzer Solve? Slow Internet speeds are known to hound organizations. Using Netflow Analyzer, users can monitor bandwidth consumption across a network. This is especially helpful in bandwidth troubleshooting and capacity planning. NetFlow Analyzer excels in detecting security threats and isolating them to prevent further damage within a short period of time, thus, network incidents are taken care of faster. If you are interested in NetFlow Analyzer it might also be beneficial to investigate other subcategories of Best Network Management Software gathered in our base of SaaS software reviews. Each organization has different wants and requires an application that can be customized for their size, kind of employees and clients, and the particular industry they are in. For these reasons, no platform can offer perfect functionality out-of-the-box. When you try to find a software system, first be sure what you need it for. Read some NetFlow Analyzer reviews and ask yourself do you want basic functionality or do you want advanced features? Are there any industry-specific features that you are seeking? Find the answers to these queries to help your search. There are plenty of elements that you need to mull over and these include your budget, particular business wants, your organization size, integration needs etc. Take your time, check out a few free trials, and finally select the platform that provides all that you want to improve your company efficiency and productivity. 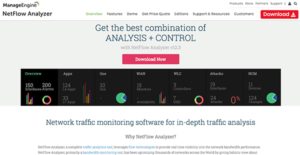 How Much Does NetFlow Analyzer Cost? We realize that when you make a decision to buy Network Management Software it’s important not only to see how experts evaluate it in their reviews, but also to find out if the real people and companies that buy it are actually satisfied with the product. That’s why we’ve created our behavior-based Customer Satisfaction Algorithm™ that gathers customer reviews, comments and NetFlow Analyzer reviews across a wide range of social media sites. The data is then presented in an easy to digest form showing how many people had positive and negative experience with NetFlow Analyzer. With that information at hand you should be equipped to make an informed buying decision that you won’t regret. What are NetFlow Analyzer pricing details? What integrations are available for NetFlow Analyzer? If you need more information about NetFlow Analyzer or you simply have a question let us know what you need and we’ll forward your request directly to the vendor.